So Everyone Enjoys Tacos Right? Well....we think so which is why we set out to make healthy, scrumptious, mouthwatering tacos. Growing up in the Southwest, we developed a love of Mexican food of all types from a very early age. There are so many different types of Mexican food that vary by region and we have tasted them all. We decided that while most people buy a vending cart to sell hot dogs, we would use our cart to share the tastes of the gourmet tacos we love. We have had a blast tasting, twisting and perfecting the different fillings and salsas we bring to the table for your enjoyment. You can find us at a variety of special events and festivals throughout Palm Springs. We are also available to cater private events at the location of your choice whether it be a wedding reception (or on the other end of the spectrum...a divorce celebration), birthday party, graduation celebration, bridal shower or a poolside gathering in your backyard. For a fun, unique and delicious experience call us for your next special occasion! So it started in 1989 on the tennis courts of a high school in Scottsdale. Competitive tennis players from a young age, our paths first crossed when we were paired as doubles partners on our high school team. We became fast friends and great teammates. We lost touch after high school and went on to have successful careers. Fast forward 20 years and our paths crossed again…on the tennis court. We picked up right where we had left off, as if no time had passed at all. In the 20 years we were apart, Shantal had had success in the restaurant/hospitality industry and had spent time training to be a sommelier and selling wine. She worked in many of the most well-respected restaurants in Phoenix and Scottsdale as well as had stints at some highly acclaimed restaurants in San Francisco and Manhattan. Meanwhile, Alana had been busy furthering her formal education and building a successful recruiting career. In March 2010, after years of working hard to make other companies successful, we decided that it was time to take a leap and start our own company. For years we had been told “You work way too hard to work for someone else. 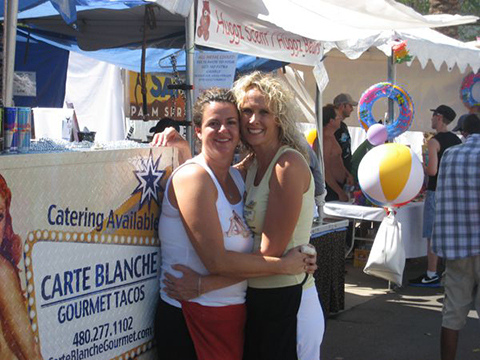 You should have your own business.” Combine that work ethic with a love of Mexican food and Carte Blanche Gourmet Tacos was born in July 2010. Carte Blanche was designed to be a gourmet catering company with a kitschy and fun flair complemented by our little cart which sports a retro pin-up girl. As Palm Springs natives, it was only natural that our focus would be Mexican fare. We love Mexican food of all types and set out to create our own niche with gourmet tacos like you have never tasted!